BAE sent a letter to the Minneapolis Board of Education expressing concerns about their impromptu changes to the MPS budget at their April 10th meeting. This time of year is always hopeful. There is Rev. Martin Luther King’s birthday that brings many inspiring recollections of powerful civic action. Then we roll into black history month, a time to honor the outstanding contributions black people have made in the world. Then nothing. The rest of the year is business as usual. 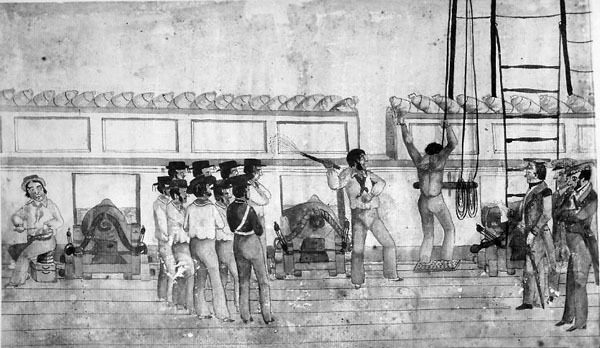 Our people languish beneath the poor leadership and competing agendas of the powerful. We know it doesn’t have to be that way. BAE realizes we can’t challenge everything, all the time, but we can focus on the places where advocacy can change the game. For us that place is in education. There is nothing more important than the success of our children in public schools. We know their future won’t be bright without great schools, great leadership, and community accountability of our public systems. Sadly, the way things look in Minneapolis Public Schools right now, our children are not getting the education or care they deserve. That must change. We expect better for our students and we won’t stop until they have what they need. Two days ago we sent the letter below to the Minneapolis school board calling attention to a few things we think matter most (for now). Our short-term concern is with the hiring of the next district leader. That process should be transparent, community-inclusive, and focused on acquiring a fully credentialed, experienced superintendent who has a record of addressing educational disparities. Our long-term focus is on systemic change that focuses on improving outcomes for black students. Stand with us folks. 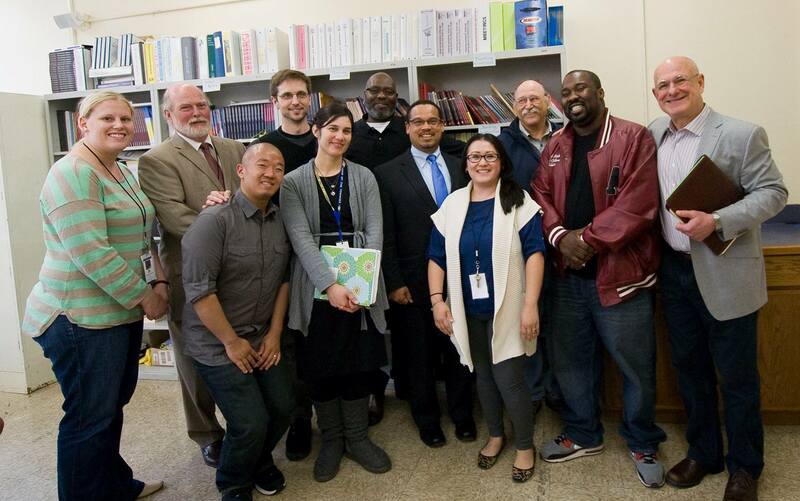 Help us to advocate for better education in Minneapolis. Minneapolis’ superintendent of public schools is fond of saying we should send her kids who are well-rested, well-fed, and “ready to learn.” She strikes a Victorian tone when she talks about the number of absences students have, how it impacts their education, and how it tanks school performance. She’s not alone in viewing parents and families in terms of their deficits. 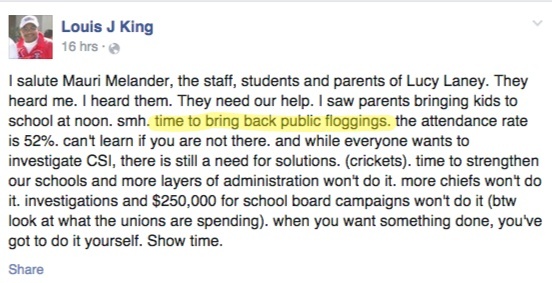 A recent visit to Lucy Laney K-8 school prompted a Northside “leader” to post a message that called for a return to days where parents could be punished with public floggings. For the record, BAE does not support public beatings for parents when their children are late to school. We don’t condone private beatings either. Violence against women is always wrong. Black children who attend Minneapolis’ public schools experience many compounding in-school inequities that could be corrected if district and community leaders had the political will to accept responsibility for their system. We can’t blame parents until the system (and all its $100,000 salaried personnel) do their job. For instance, on a recent visit to Lucy Laney BAE members learned that their students have been complaining about being hungry after lunch. When their principal looked into changes in their lunch program she found out that district nutritional guidelines call for a range of food portions, not hard rules for how much kids get to eat. But the enormous red flag of inequity was that Laney students, who are among the poorest in the district, get portions in the low end of the range. Her 8th graders are eating kindergartner sized meals. Let that sink in: poor black children are getting less to eat than middle-class white kids. Who do we flog publicly for that one? Which part of poor parenting can we blame for schools that feed rich kids better than poor? Suspensions and the criminalization of young black, brown, and American Indian students is persistent enough in MPS to trigger an investigation with civil rights officials in the Department of Education. …a MinnPost analysis of 2012-2013 MPS salary data shows the teachers with the highest salaries clustered in the wealthiest, whitest schools. These are the teachers with the most experience and the most advanced degrees. Meanwhile the lowest paid, least experienced are concentrated in the district’s most challenged schools. We know classroom instruction is the most important in-school contributor to student achievement. So why is the school system cheating the students most in need of great teachers? At the high school level black students are in schools with the fewest course offerings. For instance, South and Southwest High Schools have well over 230 unique course offerings. North High School has 88. Please remember that when politicians come kissing babies, shaking hands, and proclaiming how much they love the Northside. Some times the “equity agenda” they speak of does not exist in their policy making. These types of systemic issues put children behind. The best behaved, well-rested children with the ideal parents would be impacted by a public education system that gives them less of everything needed to produce high levels of learning. So, while it may be tempting to pull out the old world maternalism of a superintendent who channels Mary Poppins when speaking of our children (calling for them to be suitable for schools rather than the other way around), or the get-off-my-lawn paternalism of well-fed suburbanite community “leaders” who lord over inner-city programs and advocate classist violence against the stereotypes of urban black mothers, let’s consider focusing on ensuring the school system taxpayers fund is not so incompetent as to compound societies inequities rather than mitigate them. Lucy Laney is a great school to consider all the ways in which a district can pile on the discrimination. Kids there have less access to the best paid, most effective teachers. They’ve get assigned students in a pattern that makes the schools more segregated and full of students with challenges. They even get fed less. None of those problems are caused by parents or students. At the end of the day these “leaders” earn nearly $200,000 annually. That comes from government and philanthropy. At very least we can expect more than rhetoric from them that blame shifts while entire systems misfire. A communication from Bernadeia Johnson to Minneapolis Public School teachers informs them of a pending story in the Star Tribune that might show teachers in struggling schools have the lowest average performance. The implications are huge. For years MPS has endured battles of equity among competing school constituencies, with those in wealthier parts of town accused of using politics to gain advantages for their schools. This includes the ability to get poor performing teachers removed. Those teachers are suspected to end up in poorer schools where the political power of parents is routinely defeated by district brass. The revelation that Minneapolis may be housing its least effective teachers in schools with high populations of poor children of color follows national research that shows students who need the best teachers often get the least effective their districts have to offer. I believe one of the most critical factors in improving student achievement is through the continued development of our teaching force. 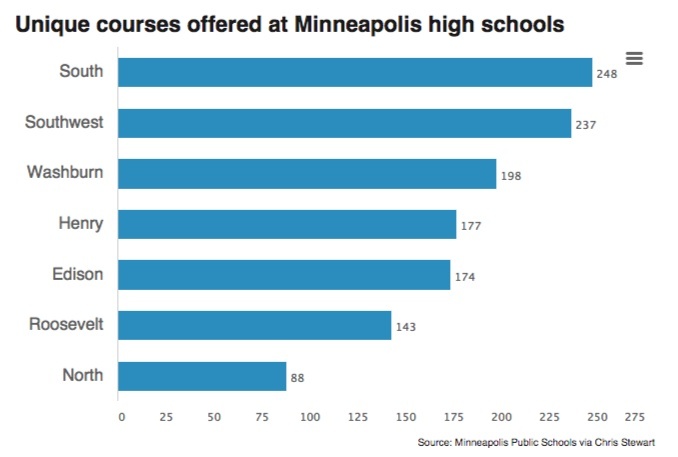 You are doing the highest-impact work in Minneapolis Public Schools (MPS), and it is my job to ensure that you have the tools and resources you need to excel in your role. I want you to be aware that the Star Tribune recently requested and received aggregate teacher evaluation data. We are required by the Minnesota Data Practices Act to comply with the data request. MPS’ General Counsel was in communication with attorneys from the Minneapolis Federation of Teachers (MFT) to determine the level of information that we were required to release in accordance with state law. We expect the Star Tribune to publish its story in this Sunday’s paper. I know you are working extremely hard to prepare our students for their futures. Teaching is a selfless profession that takes heart and demands greatness, and you deserve credit for choosing to dedicate your lives to our students. We all know that a strong education is a gateway to infinite possibilities. I visit many classrooms throughout the school year, and I am inspired by your quality work and commitment to our students’ futures. Our interest is to support you to be the best possible teacher you can be. Throughout the data request process, we made it a priority to protect our teachers’ privacy. I want to be clear that individual teachers cannot be identified in the data, and that only school-level data was provided to the Star Tribune. The data provided to the Star Tribune represent information generated for school reporting purposes from Standards of Effective Instruction (SOEI) observations and student surveys. These reports, along with school-level aggregate value-added data, represent a good-faith effort to fulfill the Star Tribune’s data request. It is my understanding that the newspaper may publish a map that displays average teacher performance by school, which will show that schools in high-poverty areas have lower average teacher performance. This type of map does not accurately reflect the diversity in skill and performance of our teachers. The story will likely include the status and significance of teacher evaluation at state and national levels. The newspaper does not represent MPS’ interests or my personal views, so I want you to hear from me about why our teacher evaluation system is important to the success of our teachers and students. · Identify teachers who are making significant gains with all of our students, especially our lowest-performing students so that we can learn about and replicate your practices. I hear from many of you that you welcome the opportunity to develop and strengthen your skills. You take pride in your work, and you want to be the best teacher possible for your students. This is the type of mindset and expectation I have of all of our teachers. On occasion, there are teachers who struggle, and we provide help for them to improve or transition them out of the profession. Many MPS teachers have been involved in the creation and implementation of our teacher evaluation system. We couldn’t have built this system without your engagement and input. As with any big system change, we continually adjust and improve the system to ensure it is beneficial to teachers, leaders and ultimately, our students. I appreciate hearing from teachers about this system’s successes and challenges. Thank you for choosing Minneapolis Public Schools as the place to make a difference in the lives of students—they deserve you.